A day after Gorkha Janmukti Morcha president Bimal Gurung announced he would resign from the Gorkhaland Territorial Administration to spearhead an agitation for a separate state, the party’s youth front pledged wholehearted support to his decision asserting they were ready to shed the Gandhi-wadi style of struggle. Bolstered by Gurung’s speech on August 7 in Darjeeling where he urged the youths to promote agitation, almost all GJYM leaders today emphasised the need to give up the GTA for the sake of securing a separate Gorkha state. “We welcome our party president’s decision to quit the GTA and start the statehood agitation. We have are being suppressed by the state government while the central government appears least interested in our issue. Now we cannot continue with the Gandhi-wadi Andolan because the water has gone over our heads,” thundered Barood Thapa, the GJYM Kalimpong sub-division president, in a public meeting held today in Darjeeling. The youth wing supports Gurung’s decision to kick-off an agitation, but it also wants the GTA to be discarded outright. “Allegations have been hurled by the Opposition that an agitation cannot be started while running the GTA. By doing away with the council, our party president will give a fitting reply to the detractors and that is exactly what we want,” said Thapa. During the last phase of the Gorkhaland movement in 2013, Gurung had resigned as the chief executive of the GTA on July 30 but assumed office again on December 26 of that year. Last year too, on September 10, Gurung had threatened to resign but did not carry out his threat. Thapa also warned of a Kashmir-like situation in Darjeeling in a thinly veiled threat to the state and central governments to get their attention. “We have pledged to follow Gandhian principles and have done so. But now we will be forced to make Darjeeling into another Kashmir if the central government does not give us justice,” warned Thapa. Samardeep Blone, the Kurseong sub-division general secretary of the GJYM, put the onus on the Centre to come true on its assurances. He said BJP leaders should take note of the situation developing in the hills. “Through this public meeting, we want to ask the Prime Minister when would his statement of ‘Gorkha ka sapna, mera sapna’ become a reality. We are also tired of requesting the Darjeeling MP of placing our demand in Parliament. Now time has come for the BJP led Centre to keep its promise as mere assurances will not work anymore,” he said. Other youth leaders took barbs at the hill TMC, the Gorkha National Liberation Front (GNLF) and Jan Andolan Party (JAP) alleging they had sold the statehood demand for petty politics. “They speak what they are directed by Bengal. The 1986 agitation was compromised because of betrayers and the same is happening now. But now we will not forgive the betrayers,” said Bhim Subba, president of the GJM Bijanbari-Goke constituency. Meanwhile in Kurseong, GTA Sabhasad Anit Thapa said eight Sabhasads including himself would also resign if the party president went ahead and quit. 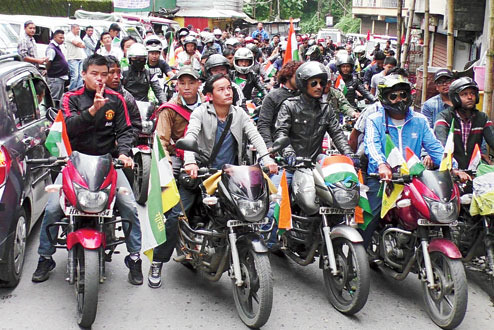 GJM general secretary Roshan Giri said the decision taken by the Sabhasads from Kurseong sub-division to resign was right. “The decision by the Sabhasads from Kurseong is a right one. We expect more Sabhasads to follow suit. We will be holding meetings over the next few days to discuss the issue,” said Giri, who is also a Sabhasad from the Sitong-Latpanchar constituency. GTA Sabhasads Anit Thapa, Yogendra Rai, Anju Thapa, Ratan Thapa, Pranay Thapa, Prabha Chhetri, Mahendra Pradhan and Champa Bibar from Kurseong and Mirik sub-divisions today announced they would also follow suit if the GJM president did go ahead and resign from the GTA within two and two and half months, as announced on Thursday.